Returning to Manchester Central on 3-4th April, this year’s event will have a timely focus on cyber security. Despite the introduction of GDPR, the last 12 months has seen organisations suffer from some of the biggest cyber-attacks and data breaches around. But with the regularity of cyber-attacks unlikely to change in the coming year it has never been more important for cyber security to be at the forefront of discussion. IP EXPO Manchester is set to bring together cyber experts and industry leaders to help attendees better understand how they can protect their business against modern cyber threats. One area in particular that attendees will be able to learn about is social engineering. 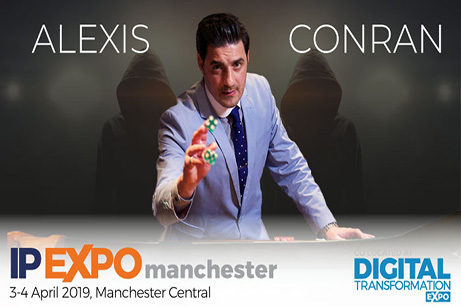 Alexis Conran, best known for working on the BBC’s Real Hustle is set to bring his unique experience of the dark and deceptive world of hustling and con-artists to IP EXPO Manchester. On day 2 of the event, he will dig into the risk and security threats we face in our society, and will be providing advice on how to keep up to date with the newest scams and how they can be avoided. “As the cyber threat landscape continues to evolve, organisations need to be constantly evaluating new areas of innovation and solutions to protect their business. IP EXPO Manchester will bring industry leaders and experts under one roof, each sharing experience and knowledge on how we can successfully stay prepared and protected in the wake of future attacks” comments Andy Steed, Content Director for the IP EXPO Event Series.